Researchers from the National Institute of Standards and Technology (NIST) are conducting simulations at the Argonne Leadership Computing Facility (ALCF) to advance the measurement science of concrete and to gain a fundamental understanding of how it flows. NIST, an agency of the U.S. Department of Commerce, was established by Congress at the turn of the century to develop a measurement infrastructure to help improve U.S. industrial competitiveness. Today, NIST measurements support every technological creation from nanoscale devices to global communication networks. For their project at the ALCF, the NIST research team is combining data from large-scale simulations with theoretical work and physical experiments to create Standard Reference Materials (SRMs) for concrete to allow for more accurate viscosity measurements. SRMs are certified and issued by NIST for use in quality control, regulatory compliance, product development, and scientific research for a wide variety of materials, including steel, rubber, and plastics. NIST has developed and released its first SRM to calibrate rheometers (blender-like devices used to measure flow properties) for cement paste. The properties of that material were subsequently used as an input to the simulation code being run at the ALCF, which is feeding into the development of SRMs for mortar (cement and sand) and concrete (mortar and gravel). The mortar SRM is expected to be available soon. The SRMs will enable accurate predictions of the flow of concrete, which is essential to exploring the use of new, more environmentally friendly ingredients for concrete mixtures. Alternative materials are key to helping reduce the energy consumption and pollution caused by manufacturing cement, one of the main components of concrete. Additionally, the SRMs will help to improve the workability of concrete by creating standardized measurements that would allow builders to request a specific concrete formulation with reliable, repeatable results. Due to the complex nature of concrete, which is a dense suspension comprised of water, cement, and an aggregate, such sand or gravel, the use of high-performance computers is required to develop methods that accurately measure its properties. Building on their past ALCF work, which dates back to 2008, the NIST project was awarded another 20 million core-hours at the facility in 2013 through the U.S. Department of Energy’s Innovative and Novel Computational Impact on Theory and Experiment (INCITE) program. 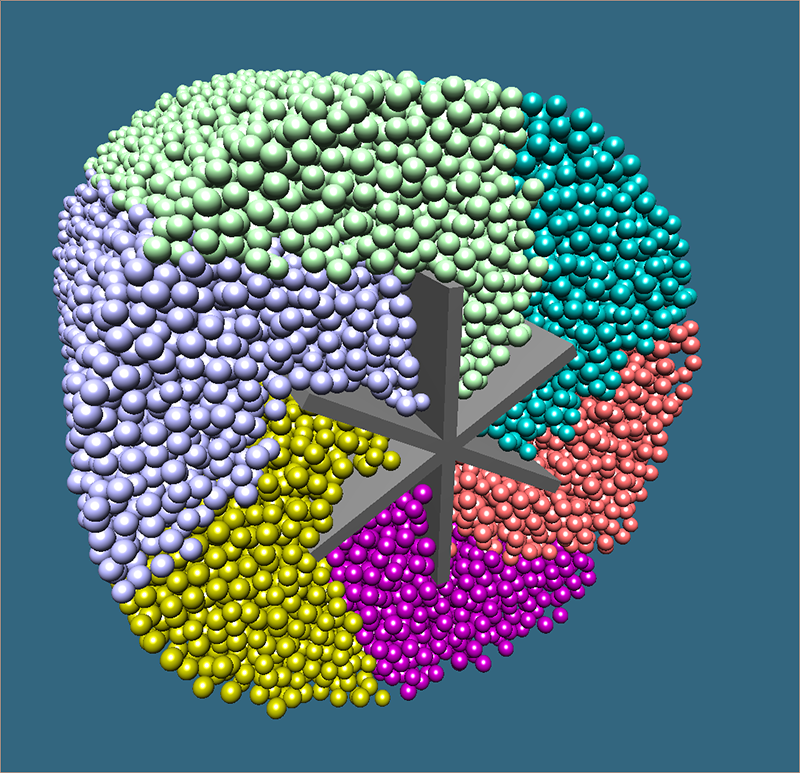 With the power of the ALCF’s supercomputers, the scientists are able to validate experimental findings and study dense suspensions in much more detail than can be done in a laboratory. 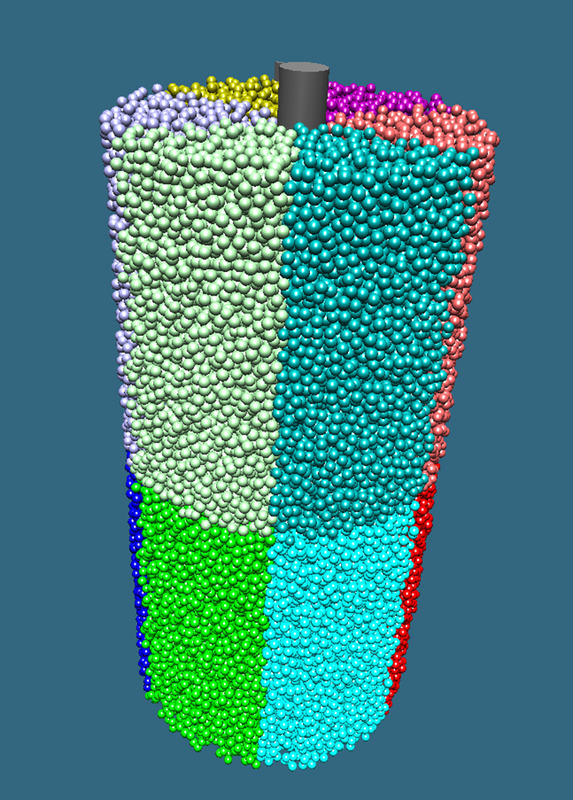 These simulation images show suspended particles in a rheometer for NIST's proposed mortar SRM. The spheres, which are color coded by their starting location in the rheometer, are suspended in a cement paste with properties derived from NIST's cement paste SRM. Nicos Martys and Steven G. Satterfield, National Institute of Standards and Technology.